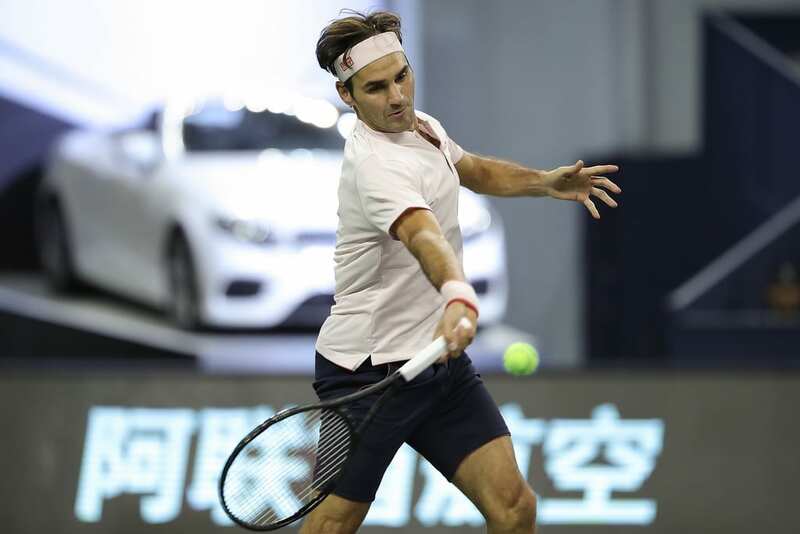 Another hard fought victory for Roger Federer in Shanghai as he overcame Bautista Agut 6-3, 2-6, 6-4 in one hour and fifty-two minutes to book his spot in the Quarter Finals where he will me Kei Nishikori. The Swiss was coming in from a tough three-setter yesterday evening against Daniil Medvedev and was again forced to work by another flat hitting opponent who's forehand caught fire in the second set to test the defending champion who'd not lost a set to Bautista Agut in 5 previous meetings. Bautista Agut won the toss and elected to receive. A perfect opening game saw Roger hold to love. Bautista Agut levelled and then held a break point but Roger erased it. That early save gave Roger some energy and he reeled off four points in a row to break for 3-1, coming out on top in a 27 shot rally on break point. The break was consolidated to fifteen and Roger cruised through his next two service games to take the set 6-3. 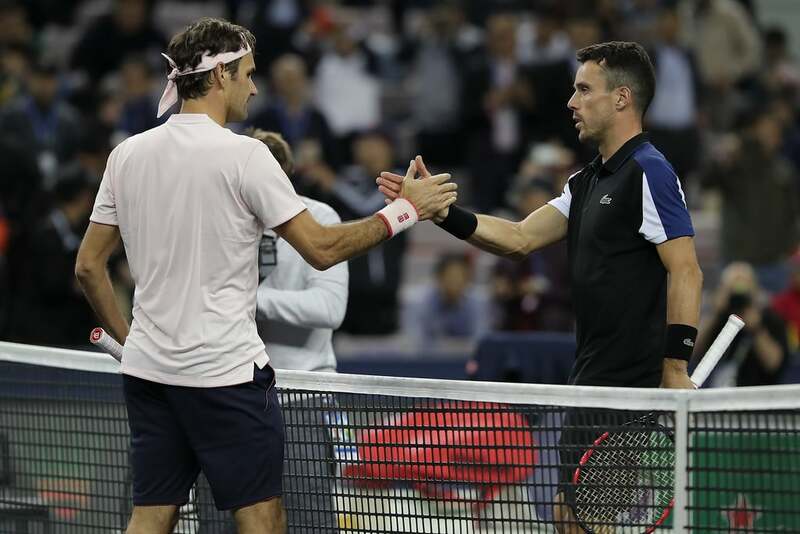 In all their previous meetings Bautista Agut has failed to find the answers and when he lost his opening service game of set two, Roger was in complete control. However, things quickly took a turn as the Spaniard hit back, breaking to love and winning four games in a row, including an unanswered 10 point streak from 1-1, 30-40 down on his own serve to take a commanding 4-1 lead. From there Roger couldn't find a way back and was broken for the third time in the set as Bautista Agut took it 6-2. With Bautista Agut's forehand firing on all cylinders, Roger needed to knuckle down in the third. He started nicely, holding a break point in the opening game but Bautista Agut saved it and then fashioned a chance of his own. However, Roger was able to dig his heels in, saving it after a long rally and from there he began to wrestle back control of the match. And despite failing to convert a break point in game three he made the all-important breakthrough in game nine, potentially aided by Mourier opting to replay a point at deuce after a late line call that didn't seem to affect Roger's netted forehand. Bautista Agut went onto save the breakpoint that followed and held two game points before Roger finally made the breakthrough so he can't feel too aggrieved. The Swiss then served it out to love with aplomb. He got everything back and was hitting a clean ball. He caught fire and it was up to me to stay with him in that third set. Taking chances, big cuts at the ball was what made the difference today. Another hard fought victory for the Fedmeister in Shanghai and that's back to back three setters that could have gone either way. In this one Roger started peRFectly, timing it nicely from the baseline from the off to win the opener hassle free. But from there on the struggle became real as Bautista Agut started to find a nice rhythm from the back of the court and made a ton of balls. Like I said in my preview, the Spaniard is a real roadrunner and Roger couldn't really find a way through him in the second and early part of the third sets. A few less than perfect approaches and first volleys resulted in Bautista Agut having time on the ball to rip some decent passing shots. As a result, Roger only won 6 of 16 at the net in set two and even though he served at 79% he only 47% of points behind his first serve, plus didn't win a single second serve point ?. A worrying drop off to be honest (too casual? Temperature dropping making winners harder to come by?) but the fact he turned it around in the third set by sticking to his guns is all that matters. Next up is Kei Nishikori who defeated Sam Querrey in two tight sets. I saw the end of the first tiebreak and Querrey was the first to hold a set point on his own serve but couldn't get it done. Kei took advantage and then broke serve when Querrey served to stay in the second set. The Japanese has been in reasonable form of late making the semifinals at the US Open and the final of Tokyo last week but he's always capable of throwing a bit of a howler when he has a crap serving day so I expect that to be one of the determining factors tomorrow. If he serves well then it's going to be another battle as he returns great and takes it super early on both sides to cause all comers problems. If he serves poorly then he's having to play catch up against the best front-runner in the business. As for Fed, he has to recover well after two fairly tough matches and keep Nishikori at arm's length by being the aggressor and get after Kei's second serve to keep the shackles on him. The other notable thing is that it's the second night match at 8 pm local time, we've seen this week when the temperature drops on an evening it gets harder for Roger to hit through his opponent so that's helpful for Kei which is why I think it's 50/50 tomorrow. Great first set but then Roger's level dropped in the second as Agut raised his game to take it to the wire. Yeah quick handshake from RBA, I think he was pissed at losing and the replayed point thing. Hope he ups his game for the next rounds.. I am not really confident..
Me too, like I say 50/50 next round, but wouldn’t be overly surprised to see Fed step it up if he’s feeling good in the legs. RBA was always going to be tricky with his flat hitting and speed. Also he made the final here in 2016 beating Novak in the SF. He likes the Asian swing. Watching the match, he served v well and rightly took advantage of a let down in the 2nd Set by Rog. But Fed handled RBA in Shanghai easily a couple of years ago when RBA was knocking on the door of the top 10, Not coming back from an injury-plagued summer so I expected straight sets tbh… agree on the determination / attack mindset though, least he not going out wondering. Another close win and again his aggressive play and amazing volleying skills that got him the win. Never seen RBA serve or return this well before against Roger. I hope Roger can serve better and keep his unforced to a minimum against Kei otherwise the semis against Coric is not going to happen. Kei has much better passing shots and taking the ball real early might keep Roger’s ventures to the net less than the previous 2 matches. But Roger always rises to the occasion and finds a way. I hope he does again tomorrow. Yeah should be close. I watched some of Kei vs. Wu and the Chinese guy had the measure of him for a big chunk of the match, so made some untimely mistakes. went walkabout.His serve was useless,everything seemed off the boil. Fortunately he came through but at four all in the third you could not have called that match,a similar situation to the Medvedev third set. two.However Nishikoris second serve is his weakness,although at the moment it seems to be feds too! Fed said that it was cold and the balls are heavy,what a pity he can’t have a daytime match tomorrow. Yeah seems to make it hard to hit through the court. The surface is fast but conditions slow. Cold balls make a huge difference as anyone who’d played winter tennis will tell you! Oo err,you naughty thing you? Delpotro out,but will Fed get far enough to take advantage? Knee injury I read, didn’t manage to watch. perhaps felt the game wasn’t worth the candle. Good comments Annie. Yes, pity no day matches. Fed’s back doesn’t like the cold. Reading through the blog…..I feel sorry for people that English is a second language! So many old sayings. Smarten up Fed and kill it on two! How about…forehand on fire, dig his heels in, sticking to his guns, throwing a bit of a howler (no idea what that means, lol), knocking on the door. Can’t take the English language too seriously. Apparently BA has form for this sort of thing.Rather silly really,they are professionals so know the score.Contrast with how gracious Tsisty was losing to Anderson(nice guy but so boring). An interesting days tennis tomorrow.Djojovic v Anderson.Saw Anderson playing today and He looks very dangerous. Could we be living in some strange surreal times when Mr Anderson is the only threat to the machine? Somebody already recently wrote that we should remember that other players wish to play the game of their lives against Fed. The task is harder for the Swiss, each time, then. I don’t care about the shots Fed missed in the second set but I will just applaud his wonderful first set today and the mental strength he has shown against Medvedev and Bautista Agut. His courage and constant motivation are admirable. I hope he will have time to rest ahead of fighting against his fellow Uniqlo-colleague tomorrow and that the low temperature announced (17-18 °C) will be ok for his old bones. 10 titles (3 GS, 3 M1000, 3 ATP 500, 1 ATP 250). Good points papillon – we forget, don’t we? We want him to win everything! Yet even with “he should have won IW” and “he should have won Halle”, he’s STILL at 89% wins??!! Wow. That kid was getting into it all match. Glad Fed is finding ways to win. His serve doesn’t seem to be as dominant, not for sure if it’s lack of pace, placement or weather as mentioned. The saving grace may be that Nishikori’s second serve should be feasted on by Fed. Haven’t seen kmph numbers but don’t think it’s down. 2nd serve just not been as accurate, seems conservative on it. Agree with the “too casual?” musing Jonathan – almost as though, having got so smoothly through set one, he – not exactly stopped paying attention, but almost treated it more like a practice session, Hey we’ll practice a little of this, and a little of that, and next thing you know shots aren’t working. Good for him to stick with it in the 3rd. Hard to tell the significance of the Mourier overrule. As you point out, he saved the following break point and did craft game points so it’s not like it had a direct effect; but it’s hard when you feel like the ump is showing favoritism to a well-respected, even venerated, opponent, and must be nigh impossible to keep that out of your head. I can’t find a good replay to actually even tell what I think happened. It sounds like the replay the point ruling was based on the late call – which is actually the rule, isn’t it? Although I suppose it always comes down to that “discretion” thing – why overrule when Rog clearly put the ball in the net anyway? Still he WAS playing better again – not as well as in set 1, but running after balls, making some great volleys, coming up with some great angles. And Bautista was not as untouchable as in set 2. I think Bautista is annoyed it slipped away, but should still give himself credit for playing him tighter than he ever has before. Well I watched the match and the commentators thought the umpire called within the rules.All players have good and bad calls against them.Borg always used to say that these things evened themselves out so the best thing was to not get upset but carry one.Good advice,but then he was the Iceman? My TennisTV commies said the call had no impact on the shot. I agree, should just go to RBA. It’s too inconsistent that rule though, I would let umpires get a replay with audio and you can easily see. If the call comes after the stroke is done then shouldn’t be replayed. Ah! Thank you! I was thinking, carry one… carry one…. one bad call? One sense of balance? One… what?? Lol! Funny, could’ve sworn I’d posted on this thread! Fed’s FS % was at a shocking 43% partway through the 2nd set when I was watching. Wonder what that was all about? I think it was in the 70s at various other points. Odd. There has been a lot of surprising upsets already. Could be due to the special circumstances with the mix of fast and slow? Seems to suit Djoko…and KA maybe, so that might be a battle. Fed seems to struggle a bit, but credit to him to carry through so far, and still showing brilliance. A bit worried about next one, the circumstances considered. Go, Roger! I think you posted at the end of the previous thread.? part of a disturbing pattern,beginning matches strongly and then losing concentration or whatever it is. Yes I don’t think he was that lousy, just Agut was that good. And maybe some (un)luck played a role. It seems to me Roger plays more conservative now. Staying behind the baseline, hitting a lot of shots to the middle. Yes, he rushes to the net a lot, but he’s not as aggressive as he had been last year. More like the 2014-15 version of himself. It might be a good thing if he doesn’t have the confidence to bring out the savage 2017 version. So Mr Anderson is not the one? Hey. That was a clutch tie-breaker. Honestly I thought that set 2 was gone at 1-4 but when Roger fired two serve missiles, the chances for a turnaround suddenly looked much clearer. Kei looked a bit tight half-way through the TB, though. Goodness what a match.Feds backhand now seems better than his forehand.Lets hope he can get to bed reasonably early. Nothing to challenge…Ball is clearly IN on Roger’s side and his return netted but its been called out by line person…so umpire overruled and asked to replay point…. Ahh thanks Nambi, but that’s not favouritism then, if a player hears “out” it’s natural instinct not to hit it cleanly, had umpire given point to Roberto, then Fed could argue that he was cheated out of the point due to distraction of the line call. Roberto can surely only blame the linesman, not the umpire? … and I bet for Zverev to beat Djokovic !